Fishing Forum : Misc. Fishing Forums: Fishing Preservation & Conservation: Deep hooked fish can be released. I have found if the line is cut close the fish will dissolve the hook most of the time. I have done that on several occasions versus trying to dislodge a deep hook or keep the fish [trout] out of the water too long. 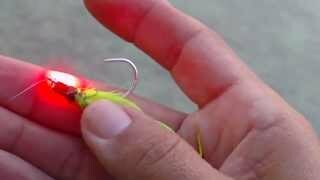 Hi WillCFish,the problem with leaving the hook in the fish is that it continues to cut the fish as it rust resulting in infection.There are two safer methods,#1 try a barbless worm hooks or just squeeze the barb down then you can turn the hook and pull it out. You might get minor bleeding but it won't kill the fish like it would if you tore out a barbed hook from its gullet. #2 There is a hook called "The Harmless Hook" which was specifically designed for conservation safe catch and release, even has a protective antimicrobial coating to protect against abrasion.This hook was design with a special coating so you can leave the hook inside the fish while it dissolves.Here is the info on it.Plus its American made! You can google it "Harmless Hook safe catch and release"
The Harmless Hook is a patent-pending fish hook that is friendlier, easier to remove, and causes less harm then standard fish hooks.The Harmless hook contains an antimicrobial-protected coating that reduces the abrasion damage caused during hooking, landing, and removal. It results in less harm, less stress, and increased fish survival rates. The only hook of its kind, the Harmless Hook for catch-and-release fishing and is 100% American made. Harmless Hook fish hooks were developed to be left safely in the fish if they cannot be removed. Unlike other fish hooks which continuously cut the fish as they rust and corrode, the antimicrobial-protected coating creates a physical barrier between the fish and the hook while it dissolves. No more struggling and damaging the fish trying to get the hook out. Just cut your line and set the fish free. Harmless Hook fish hooks are used like any other fish hook. You wont notice a difference except for the special coating. The package contains five (5) fish hooks in size 2. This is the most common sized hook used to catch typical pond and lake fish. I'm going to order a pack of the hooks and give them a try.